Samford University’s School of the Arts will host a unique performance by celebrated pianist Sophia Gilmson Nov. 1. Gilmson will perform the Goldberg Variations by J. S. Bach on both harpsichord and piano. The 7:30 p.m. concert in Brock Recital Hall is co-sponsored by the Davis Architects Guest Artist Series and the Fletcher and Nell Morris Piano Competition. Because this concert is so unusual, Samford is offering a heavy hors d’oeuvres reception for concertgoers at 6 p.m. and a pre-concert lecture at 6:30 p.m. in which Gilmson will discuss stylistic choices related to the evening’s twin performances. The school will host a dessert reception during intermission. 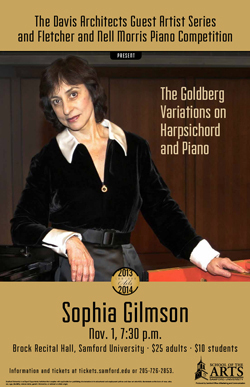 The Goldberg Variations, among the world’s most celebrated musical creations, was written for harpsichord. Although there are many recordings of harpsichord and piano performances, Gilmson offers the unique opportunity to hear both in a single concert and by the same performer.